Gift cards represent your brand. Count on us to provide attractive, durable, high-quality gift cards that you can be proud of—and that your customers will be proud to give. 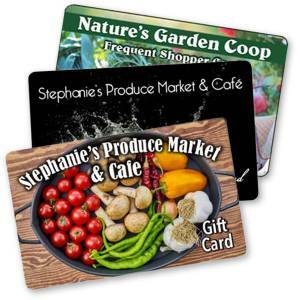 Gift cards can display your logo, colors and messages. ECRS® offers a completely self-hosted, easy-to-use gift card system as an optional module to the CATAPULT® system. ECRS gift cards are based on barcode numbering sequences and can be ordered from ECRS, purchased from a third-party printing service, or printed in-house. Cards are re-usable with gift amounts added simply at the POS by authorized personnel. Gift cards are easily redeemable as a tender option at the POS or self checkout terminal. Retailers can also elect to process refunds on a gift card instead of cash returns. Cards can be used across multiple locations in an enterprise. Printing: Digital printing is a high-quality, 4-color printing method available for short or long runs at a cost that is less expensive than offset printing. It will allow for a full bleed of the artwork to the edges of the card. Digital printing also allows for color and graphics on the back of the card at an additional cost. Finishing: The standard finish for gift cards is clear gloss, but a matte finish is also available. Values: Gift cards may be ordered with an open or pre-set value. If you choose to pre-set the value of your gift cards, each value grouping must be ordered at a minimum quantity of 1,000. Set-up: There is a set-up fee of $65 for all new orders. This fee does not apply to re-orders using the same artwork.